Coyotes are highly adaptable animals that eat a wide variety of foods, and often scavenge. While mostly nocturnal they can be and are often active during the day as well. Coyotes are found throughout the Americas all the way to the artic. Coyotes carry a number of diseases that are harmful to humans and domestic animals such as distemper, hepatits, parvovirus, mange, rabies and tularemia. In the past coyote attacks were virtually unheard of but as coyotes have become more adapted to urban settings attacks have been on the rise. Attacks are more common in the spring females are raising their young. Attacks on livestock and pets are also on the rise and humans encroach on their territory. In addition to attacks on livestock, coyotes cause damage to crops, cause traffic accidents and occasionally find their way onto and airport runway! Coyotes should be left to the professionals. There are ways to control coyotes around your home or business. 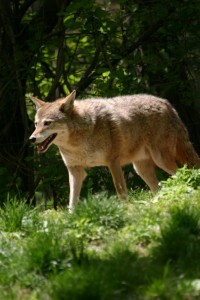 We offer coyote removal and control services as well as programs to help keep the threat away.